H’s new coat took about 6 months to grow back completely. As she loves going outside and writhing around in dirt on her back, her coat became a grit magnet and she soon became knotted and matted. She wouldn’t allow us to groom her and would struggle away within the obligatory half a minute. So it was time to call Catnips again! With last year’s experience in mind, Anita suggested it best to get her sedated at the vets this time. Anita met us there with all her equipment. Dr Carmichael at Addison’s Vets gave Halley a quick examination due to her age to check she would be safe under anaesthetic, and then gave her a sedative before Anita set to work. Whilst we went for a walk in Holland Park in the beautiful sunshine. About an hour later, Anita called to say all had gone well and H would be ready in 15 minutes. Anita has once again done a great job and Halley has emerged very fashionably chic, it looks like she’s got a fur shrug around her shoulders with a lovely swishy lion tail. Thanks for making my cat look beautiful again Anita! Also thanks again for the lift home yesterday. Being able to get Halley back into her normal environment quickly made a huge difference. Grooming under sedation is sometimes the kindest route to take when a cat is too frightened and too badly matted to remain awake during the de-matting process. If you have a cat who you are having trouble grooming then please contact Anita Kelsey. 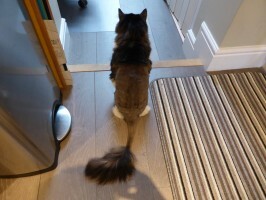 cat grooming under sedation London has never been easier and can be arranged as a matter of urgency.